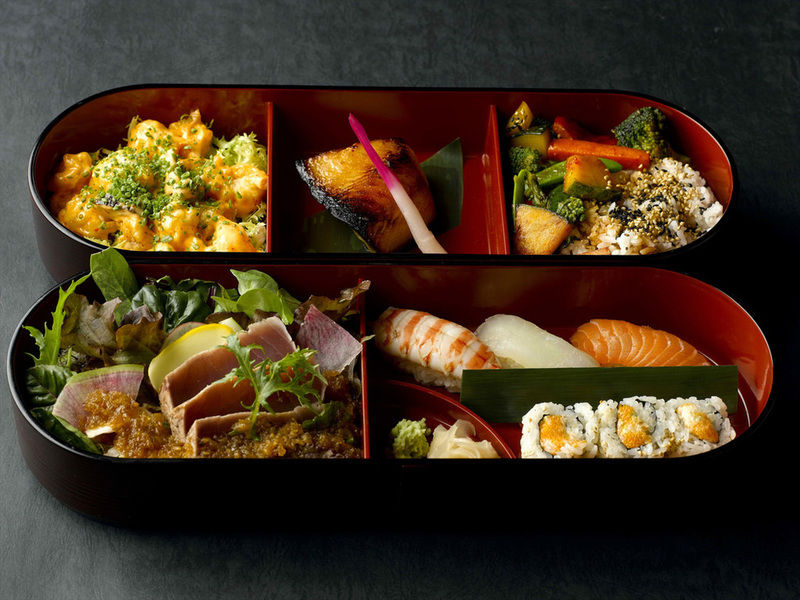 Bento is the classic Japanese lunch box. Sold everywhere from convenience stores to supermarkets to railway stations, or simply handmade at home, bentos come in various shapes and forms, and can be enjoyed at all hours of the day. In this article, we will dive into what a bento is made of, its historical background, and some of its infamous variations, such as the “ekiben” or the “kyara-ben”. A bento is essentially a Japanese lunch box packed with rice and various okazu (おかず | side dishes made with meat, fish, vegetables, etc. that compose a traditional Japanese meal). People typically bring bento to work/school and on day trips. Making bento has traditionally been a woman’s job in the household, and many Japanese wives make bento for their husbands and children. Women in relationships sometimes prepare a bento for a significant other during their courtship, particularly during hanami (花見 | cherry blossom viewing) season for an outdoor picnic. What goes in a bento? Many apply the following ratio when packing a bento: 4 parts carb | 2 parts protein | 1 part vegetable | 1 part fruit. The packing of most bento begins with rice, the main staple of Japan. Depending on the region, some bento may emphasize potatoes or other kinds of rice (such as brown rice genmai, multi-grain rice zakkokumai, seasoned&steamed rice takikomi gohan). Most bento use Japanese white rice, sometimes with a sprinkle of furikake, a dry seasoning of sesame seeds, chopped seaweed, sugar, salt and dried fish, or some other topping. The next component is the protein part. Protein options include meat, fish, tofu, egg, beans, to name a few. Usually mothers try to incorporate two kinds of protein dishes in the meal. Fruits and vegetables (often in a pickled form) are used to pack the remainder of the box When space is a premium, fruits are packed in a separate container. Silicon wrappers and little containers can help keep dry and moist components separated until meal time. Color is also meaningful when assembling a bento, as traditional Japanese meals are known to include the following five colors as a mark of visual (and often nutritional) balance: white, black, red, green and yellow. Packing the bento tightly will prevent food from shifting in transit. 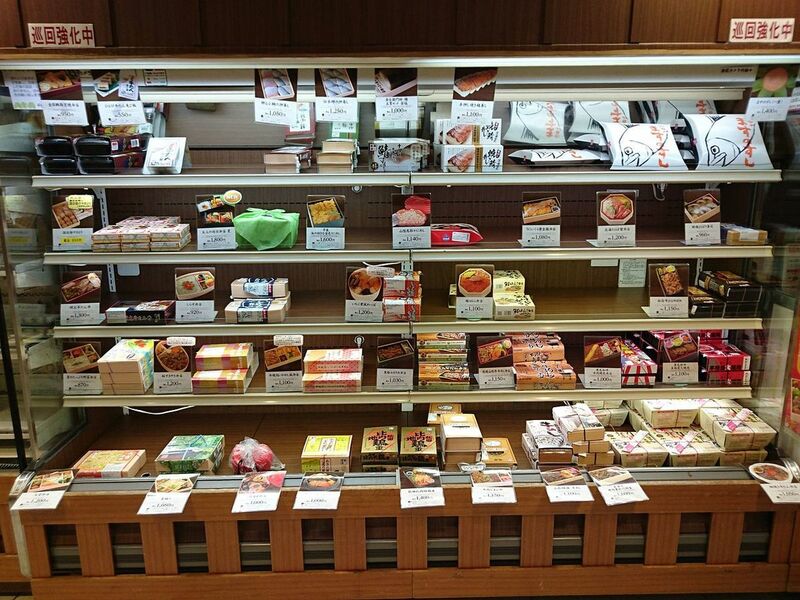 Most bentos are enjoyed at room temperature, even hours after confection. The original word for transportable, packed meals came from China during the Heian period (794-1185) as 便當 (phonetically in Japanese: bento) which even nowadays means convenient, handy. By the Momoyama period (1583-1600), the Japanese spelling of bento -弁当- had replaced the Chinese one. The integration of bento into the vernacular is often attributed to Oda Nobunaga (1534-82), a powerful lord and major historical figure who notably contributed to the unification of Japan. Nobunaga often distributed large amounts of food to his army and followers at his castle ; presumably popularizing the concept of bento while doing so. 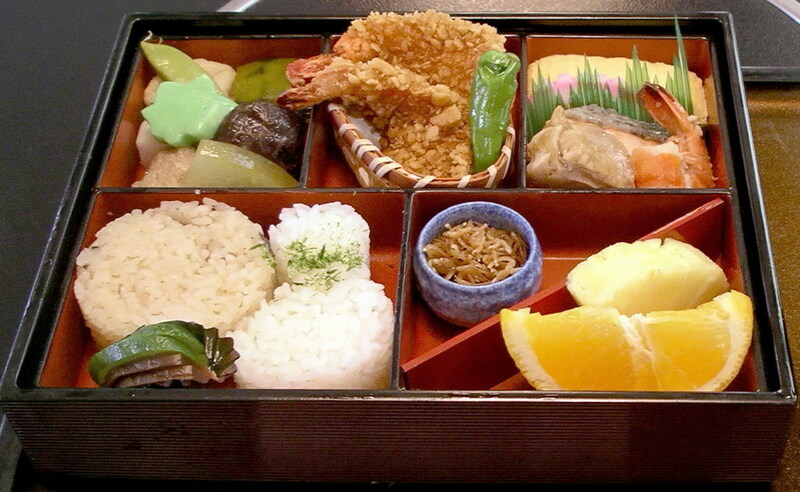 Though the word bento has a Chinese origin, Japanese have been eating packed meals since the fifth century. In Nihon-shoki (日本書紀 | the Chronicles of Japan, 2nd oldest book of classical Japanese history), there are accounts of nobles bringing packed lunches for a day of falconry. 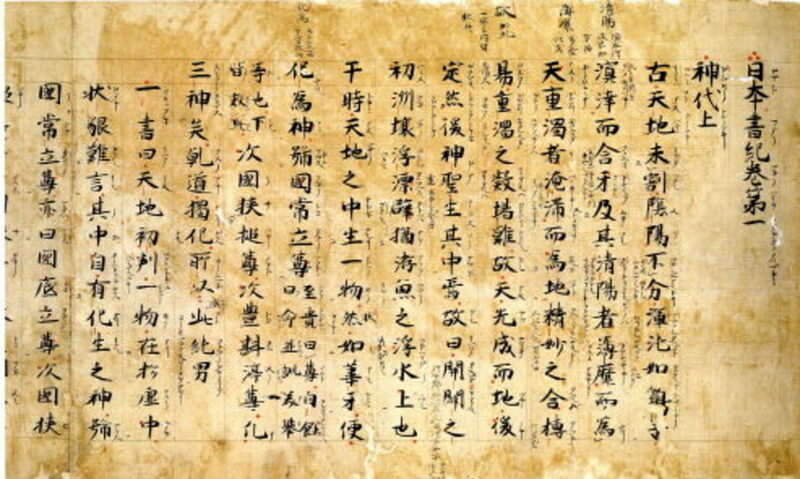 Literature from the Heian period includes scenes with travelers stopping to eat dried boiled rice and other prepared foods on their journeys. Early Japanese literature and historical records focused on the lives of nobles, but traditionally anyone working outdoors (farmers, soldiers, fishermen, etc.) brought meals with them. During the Edo period (1603-1868), the consumption of bento extended beyond utility and became an essential accompaniment for a day outdoors or at the theater. The makunouchi bento (幕の内弁当), which typically consists of small, sesame-sprinkled rice balls and an assortment of okazu, is an Edo period product. The bento gets its name from the intermission between acts of a play, and to this day theatergoers continue to eat bento during intermissions. Other Edo era bento inventions include the onigiri (おにぎり), a triangular rice ball wrapped in seaweed and typically filled with plum or fish, now a mainstay of Japanese lunches and snack foods. At the transition between the Edo and Meiji period (1868-1912), Japan was forced to end 250 years of isolation, ushering in an age of rapid industrialization during the Meiji period (1868-1912). One hallmark of the Meiji period is the construction of the Japanese railway system. 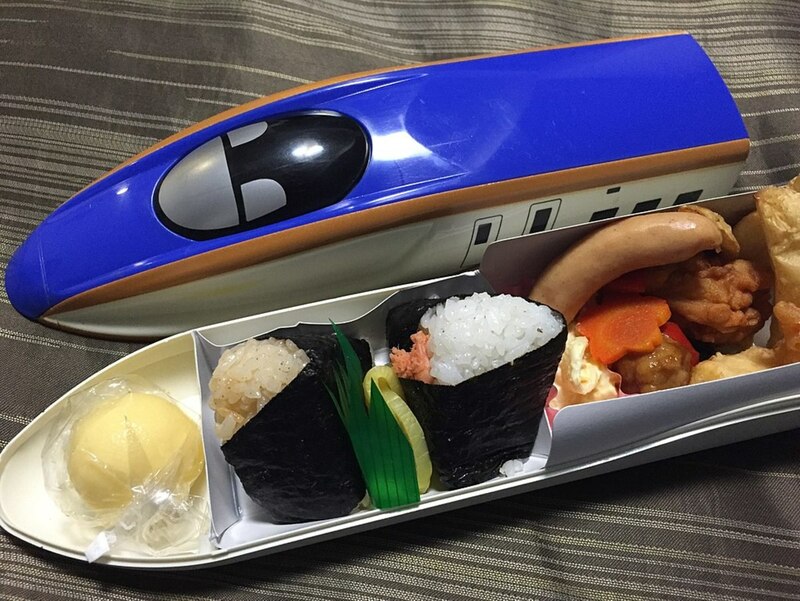 With the advent of train travel came the ekiben (駅弁), a bento purchased at a train station. Ekiben remain an essential part of travel in Japan today though nowadays people eat them on shinkansens (bullet trains) instead of locomotives. . Top restaurants in each city will often create exclusive ekibens, as a way to proudly showcase local specialties. Shin-Osaka station’s “Hakkaku Bento” (八角弁当 | litteraly 8-angle bento) has been sold for decades in its distinctive octagonal box, showcasing Kansai-style seasoning and culinary preparation. Tokyo station is famous for its extensive variety of bentos, such as Maisen’s katsudon ekiben (カツ丼駅弁 | pork cutlet over rice), from the city’s renowned tonkatsu restaurant. In Fukui, the Echizen Kanimeshi bento (かにめし弁当), comprising of Fukui prefecture’s famous snow crab, is another widely popular ekiben.. Ekiben are generally quite affordable, with most costing between 800 and 1200 yen. Koraku bento, or “picnic lunchbox,” is a large bento made to be shared by a small group. Koraku bentos are usually packed in a large box and filled with seasonal dishes. Koraku bento are often enjoyed during hanami season, when people picnic under the blooming cherry blossoms, or during kouyou, the autumnal season when forest shades turn from emerald to gold and vermillion. Many Japanese children bring bento to school until they start eating standard school lunches in middle school and high school. 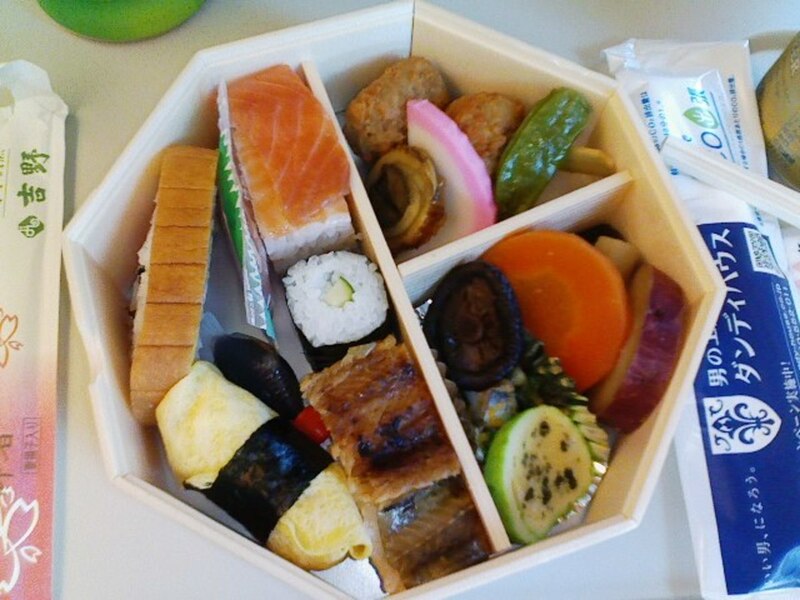 To ensure that their preschool and kindergarten children eat their entire bento while at school, some mothers have used several tricks to make their bento more appealing. First trick for parents is to purchase a themed bentobako (弁当箱 | bento box) decorated with their children’s favorite manga/anime/cartoon characters to get children extra excited about lunch. Bentobako were traditionally made of lacquer, although these days containers have been mostly made of plastic, metal or glass. Second trick is to go even further and actually display the bento content to make it look like their children’s favorite character: that’s the kyara-ben (キャラ弁, a contraction of character キャラクター and bento 弁当). 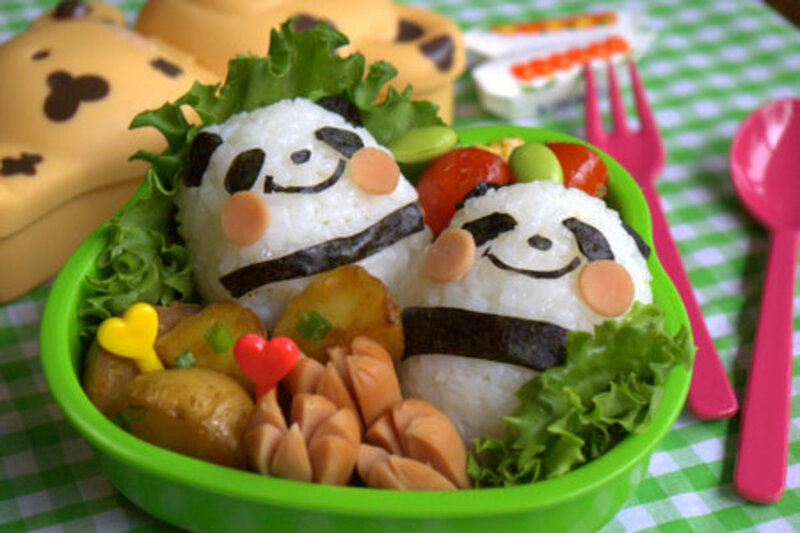 Studio Ghibli’s characters (especially Totoro), Pokemon, Doraemon, Thomas the locomotive are among the most popular, and mothers have to combine creativity and dedication to make their bento both nutritious and visually kawai (可愛い | cute). Some Japanese mothers even attend classes to learn how to make extra elaborate and enticing kyara-ben. In these classes, women learn how to shape rice into characters and make facial features from seaweed, crab sticks and various other ingredients. Constructing kyara-ben often requires the assistance of toothpicks and other utensils to make sure the details are applied correctly. Getting up earlier to make kyara-ben or standard cute bento might sound a bit crazy, but many mothers feel that the extra effort gets children to eat nutritionally balanced meals and stave off picky eating habits. Japanese children eat grilled or raw fish and steamed vegetables for lunch without complaint, fostering better food habits than a PB&J (Peanut Butter and Jelly sandwich). Thanks to their nutritious bento lunches, Japanese childhood obesity levels are among the lowest in the developed world, although other habits, like post-school activities and walking to school instead of being dropped off, factor into such healthiness. The bento process may seem a bit extreme, but eating a nutritionally balanced lunch is critical for keeping energy levels high for the rest of the day. The packing of multiple kinds of dishes may seem a bit excessive but it is actually indicative of how Japanese people cook and eat at home. Anchored by rice and miso soup, most meals consist of a few kinds of vegetable or protein-focused okazu, so bento are a great way to make use of leftovers. In Japan, people generally refrain from eating in public or walking and eating. 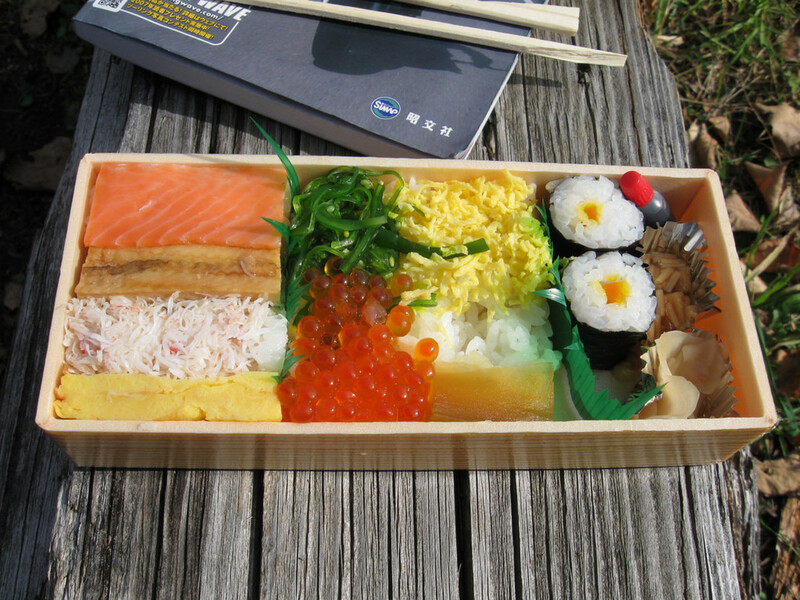 If you want to enjoy a bento outside, it’s best to go to a park or find a (rare) outdoor table. Ekiben are reserved for long train rides. On shinkansen (bullet trains), there are trays and cup holders at every seat. On trains with no tray, it is advised to refrain to eat while riding it. Eating and drinking on the subway, with the exception of discreetly sipping water or iced tea, is considered extremely rude. Streets and public transportation are clean for a reason. The efficiently compartmentalized bento box has more in common with Japanese architecture than might first meet the eye: both prioritize maximizing space. An architecture firm run by a Japanese woman and American man made headlines for renovating a NYC apartment with a bento box inspiration (link). Boston’s McCormick Gallery held an exhibit in 2015 titled “Obento and Built Space: Japanese Boxed Lunch and Architecture” showcasing cases where architects have been inspired by bento design (link).